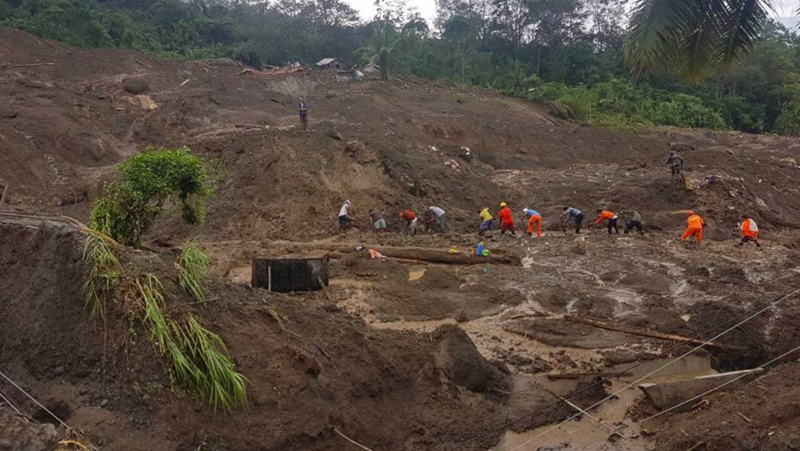 Rescue workers continue their search for survivors today following the landslide in Natonin caused by Typhoon Rosita. Picture courtesy of the Department of Public Works and Highways. Dozens are missing and feared dead after Typhoon Rosita caused landslides and flash floods across the north of Luzon Island. In one case alone, at least 30 people are believed to be buried under a massive landslide in the town of Natonin, Mountain Province. The typhoon — international name Yutu — hit the eastern seaboard of the Philippines yesterday morning. The Malacañang has announced today (Wednesday, October 31) that President Duterte will visit some of the hardest-hit areas. “The Palace wishes to express its deep condolences to the families and loved ones of the victims who perished in Natonin when the Department of Public Works and Highways building was covered by a landslide, along with others who died due to the typhoon,” presidential spokesman Salvador Panelo said in a statement. The landslide struck at about 4pm yesterday, engulfing the two-storey structure. The government offices were supposed to be empty, but it is believed site security guards allowed some local residents to seek refuge in the concrete building. “Efforts to look for survivors are going on and we pray for the rescue of those still trapped or missing,” Panelo said. Quoting figures from the National Disaster Risk Reduction and Management Council, Panelo said a total of 11,878 families, or 38,398 people, were affected in 478 barangays across the Ilocos region, Cagayan Valley, Central Luzon and CAR. Meanwhile, a total of 8,864 families, or 32,519 people — mainly living in coastal communities — had been pre-emptively evacuated from these regions. Rescue workers are continuing to search for survivors of the Natonin disaster, and also in the nearby town of Banaue, where another landslide struck. Flash floods also swamped at least two schools in the province of Kalinga. However, because classes had been cancelled there have been no reports of any casualties. By this morning, the typhoon had weakened as it exited the country, the state weather agency Pagasa confirmed. Rosita was the 18th typhoon of the season to hit the Philippines, which endures about 20 per year. It came just weeks after Typhoon Ompong — or Mangkhut — also caused landslides that left at least 150 dead across the country.